This is not an uncommon occurrance as some installers use muriatic acid to remove grout residue. It would not have happened if they had used Aldon "Grout Residue Remover". Remove stains and old coatings as discussed elsewhere in Problem Solving. "Insta-Clean" is the product for safe removal of food stains and other dirt. 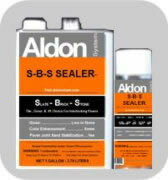 It the tile are sealed also, finish with Aldon "Lifeguard" for additional gloss and wear protection.